The report titled “Esterquats Market: Global Industry Analysis 2013 - 2017 and Forecast, 2018 – 2026” offers detailed insights and in-depth research on the said market at a global level. The report covers the important factors driving the esterquats market, untapped opportunities for manufacturers, as well as trends & developments that shape the dynamics of the market and other insights across various key segments. The market is categorically divided into five segments based on product type, feedstock, form, application and region. The market value throughout the segments is represented in US$ Mn and the market volume of all the segments is represented in tons. The report identifies the drivers and restraints affecting growth. Changing trends and consumer preference patterns are also analysed and incorporated in the report to equip the client with exhaustive information about the market, which helps in better decision making. Macroeconomic factors that directly or indirectly affect the growth of the esterquats market are also presented in the report. Towards the final section of the report, competitive landscape has been included to provide report audiences with a dashboard view. The report provides a detailed market share analysis of the esterquats market on the basis of prominent manufacturers. Comprehensive profiles of manufacturers are also included within the scope of the report to evaluate strategies, key offerings and recent developments in the esterquats market. Market volume is inferred through in-depth secondary research and validated by industry experts through primary interviews. Each interview is thoroughly analysed and an average market volume is deduced and reconfirmed, which is incorporated in the report. The prices of esterquats are deduced through product type, where the average price of each product is inferred across all the seven regions. Market value of the esterquats market is thus calculated based on the data provided by the average selling price and market volume. For the ten-year forecast of the market, various macro-economic factors and changing trends have been observed, which give an idea about the future of the market. Other important factors considered while calculating the market forecast are the size of the current market, inputs from the supply side & demand side and other dynamics shaping the scenario of the market. During the compilation of the report, the forecast is conducted in terms of CAGR, while other important criteria such as year-on-year growth and absolute dollar opportunity have also been incorporated, which present crystal clear insights and future opportunities to clients about the esterquats market. Other important parameters included in this report are market attractiveness index and impact analysis of the drivers and restraints for each region, which provide insights about the dynamics, growth, performance and untapped opportunities in the esterquats market. In-depth profiling of prominent manufacturers is included in the final section of the report that details the strengths, weaknesses and competitive strategies of each manufacturer. The key market participants included in the “Esterquats Market: Global Industry Analysis 2013-2017 and Forecast, 2018–2026” report are Evonik Industries, Stepan Company, Kao Corporation, Akzo Nobel N.V., BASF SE, Clariant, Italmatch Chemicals S.p.A., ABITEC Corporation, Hangzhou FandaChem Co.,Ltd. and Dongnam Chemical Industries Co., Ltd.
Esterquats are defined as products obtained through a reaction between long-chain fatty acids derived from plant or animal-based feedstock with substituted quaternary ammonium compounds. Esterquats represent a new generation of surfactants categorized into cationic surfactants that are mostly used in fabric care and personal care products. Esterquats act as softening and conditioning agents for clothes and in personal care products. Prominent application areas for esterquats include fabric care products, wherein they are used for the production of fabric softeners. Other applications of esterquats include hair conditioners, as flotation aids in the oil & gas industry, control releasing agents, and anti-bacterial agents, among others. The global esterquats market is estimated to be valued at US$ 903.1 Mn by the end of 2018 and is expected to reach US$ 1,135.3 Mn by the end of 2026, at a CAGR of 2.9% over the forecast period. The global esterquats market is anticipated to reach US$ 232.2 Mn between 2018 and 2026. Increasing population, urbanization, rising per capita disposable income and changing living standards are some of the major factors significantly affecting the laundry market. Automated washing machines are widely used for laundry operations in developed regions, such as North America and Europe. In developed regions, people are more focused on enhancing the efficiency and efficacy of laundry operations, owing to which the demand for laundry products, such as detergent powders, fabric softeners, etc. is significantly high. 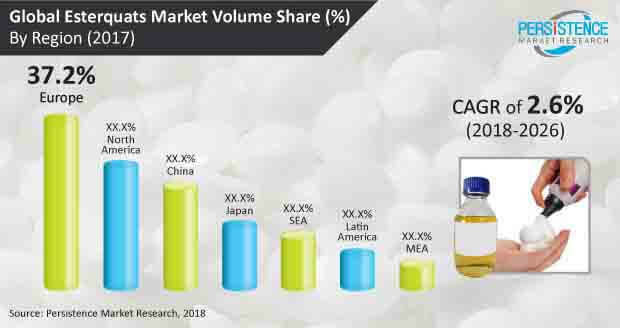 This increasing demand for fabric softeners across the globe is expected to drive the esterquats market over the forecast period. Moreover, rising disposable income in developing regions is also boosting the demand for fabric softeners. In addition, the increasing demand for personal care products such as hair conditioners, cosmetics and creams, among others across the globe is also driving the esterquats market. On the basis of product type, the TEA-quats segment accounted for more than 73.9% of value share in 2018, whereas MDEA & others accounted for rest. Growing demand for TEA-quats for the production of fabric softeners, hair conditioners and other industrial applications is expected to drive the esterquats market. However, MDEA esterquats are widely used in North America owing to their physic-chemical properties and suitability for northern American conditions. The Europe esterquats market accounted for a value share of 39.8% in 2017 and is forecasted to maintain its dominance in the global esterquats market over the forecast period. China, Brazil India and ASEAN countries are projected to represent lucrative growth between 2018 and 2026, while the North America esterquats market is estimated to expand at a significant CAGR in terms of value & volume over the forecast period. Some of the prominent players in the esterquats market are Evonik Industries, Stepan Company, Kao Corporation, Akzo Nobel N.V., BASF SE, Clariant, Italmatch Chemicals S.p.A., ABITEC Corporation, Hangzhou FandaChem Co., Ltd. and Dongnam Chemical Industries Co., Ltd.
Dongnam Chemical Industries Co., Ltd.